Step 4: enjoy your travel! If you travel a lot, you probably know that the vast range of public transport tickets available in almost every big city is enough to cause a throbbing headache. Will a monthly card pay off, or maybe you should just opt for the single fare tickets instead? This ticket optimizer spares you the tedious calculations, making the choice of the optimal (that is, the cheapest) option a breeze! Traveling with a car? Take a look at our gas calculator! In order to figure out the cheapest combination of tickets, you first need to estimate your transport needs. Let's assume you are a tourist, staying for a few days in Paris. Do you prefer to walk around the city and use public transport sparingly, on considerable distances only? Or maybe you like the flexibility and plan to use the metro multiple times a day? Trips per day. Simply, it's the number of trips with public transportation that you'll make every day of your stay. Duration of your stay. The choice of the optimal option depends on whether you're staying only for three days, or maybe for as long as three weeks. 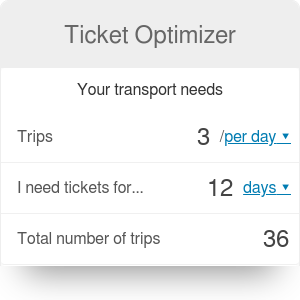 Our ticket optimizer automatically calculates the total number of trips. If you feel the number is too low or too high, feel free to play with the two variables above it to adjust it. Price of a single fare ticket. Price of a short-term ticket. It could be a weekly, biweekly, or maybe a 10-day ticket - whatever you find most suitable. Validity period of the short-term ticket. Make sure to adjust it, too! If the city you visit offers a multitude of options, you can open the advanced mode of our ticket optimizer to take into consideration another type of a periodic pass. Once you input all of this information into the ticket optimizer, your job here is done! Our tool will select the most cost-effective combination for you. Let's consider an example of a 10-day-long excursion to Berlin. Which ticket combination will be the best for you? We'll assume four trips with the metro every day during that period. Apparently, the best option is to buy one weekly ticket and three one-day tickets. If you reduced the number of trips per day to two, though, it would actually be cheaper to buy one weekly and six single fare tickets instead. Now that you're all set, you can start thinking about other aspects of your travel rather than concentrating on the transportation costs. Enjoy your stay! Ticket Optimizer can be embedded on your website to enrich the content you wrote and make it easier for your visitors to understand your message.